A badly broken nail is a sure blow on my spirit. I know that some nail bloggers would agree. It has been more than 2 weeks and although one particular nail is taking forever to grow back to the length I want, it has become decent to be shaped for a nail art. So here I am with an abstract nail design and I'll be keeping my fingers crossed that you'll like it. The inspiration came from one of my exercise pants. Well, just the color combination. It was dark gray with blue and light blue stripes on the side. I thought it was a good combo and I knew I haven't done anything like that yet. I haven't figured out the design when I was polishing my nails. But I was sure that I wanted to do something abstract and easy. After doing my manicure, I decided to fix myself something to eat. When I opened the refrigerator, I saw eggs. This will sound crazy but I actually got an idea right away after that. I'm talking about a sunny side-up egg. I patterned the nail design after fried eggs! Is this the weirdest idea you've ever heard or what? :) It just goes to show that you can get inspiration from anything! I used 2 coats of CND Indigo Frock for background polish. 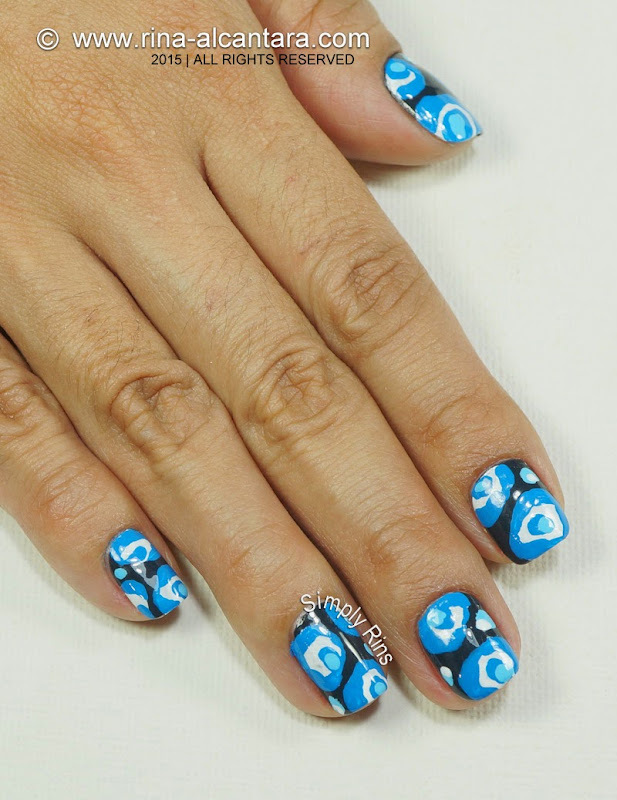 The design is freehand painted using acrylic paints and a flat nail art brush. If you are working with a dark base, layering a white paint first will be a great help for reaching color opacity and getting the true shade. 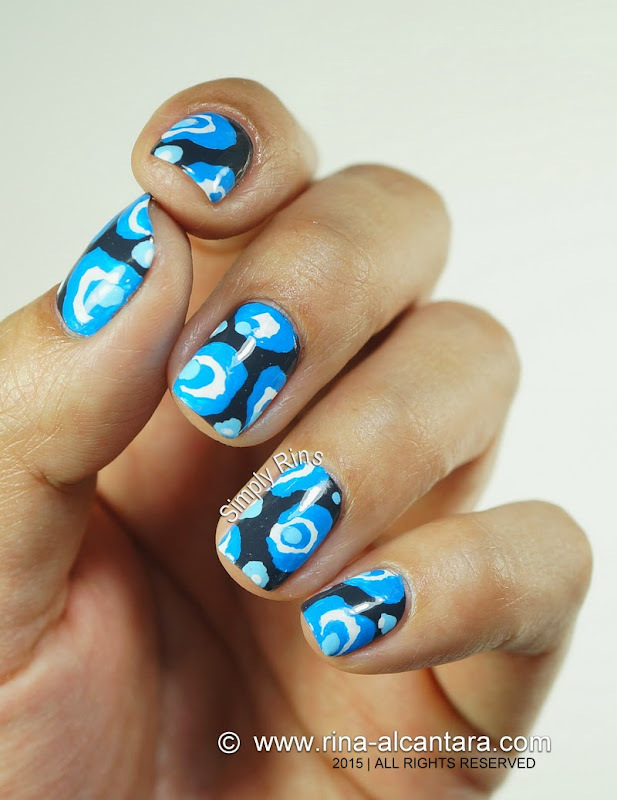 In the end, the nail art looked like blue fried eggs and as I think about it, I found it a little funny. So now, everytime I look down on my nails, I feel like eating breakfast. I also now wonder how funnier (?) this nail art would look if I chose to use a yellow palette! Or maybe not? 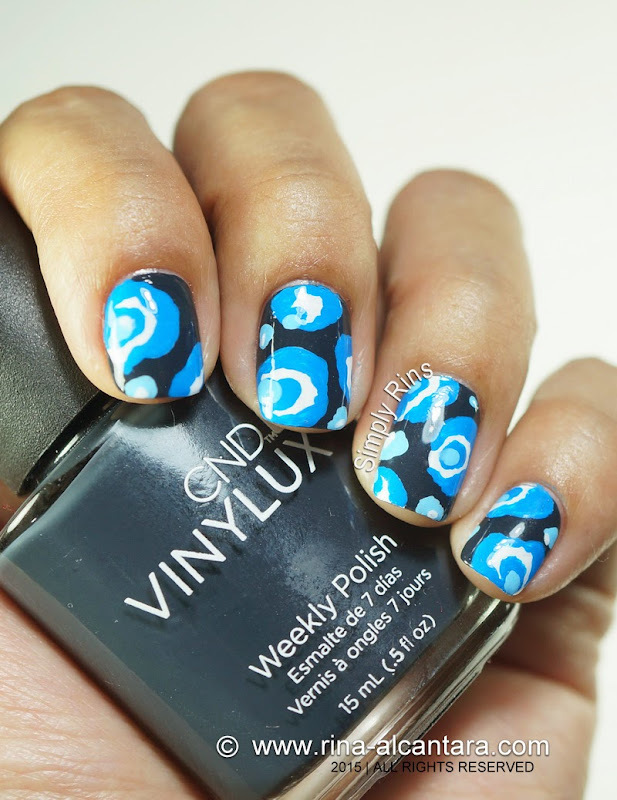 However this abstract nail art came about, I like it. It was easy to do and the design is quite attractive, to me at least. Even though it reminded me of fried eggs, the design looked like wallpaper which I particularly am drawn to when I paint my nails. I love patterns and I love uniformity on my nails.